Pastor Bobby shares what it means to live from a place of God’s love in his message: “Reflecting the Light of God” and interviews Amick Byram. Musical performances from Amick Byram, along with the Hour of Power Choir and Orchestra. Pastor Bobby concludes the message series based on the Mind of Christ with his message “From Fear to Power, Love and a Sound Mind” and interviews Roxanne and Sierra Ellison. 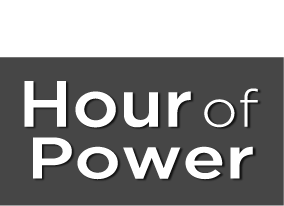 Music performances by Masters of Harmony and the Hour of Power Choir. Pastor Bobby continues the message series based on the Mind of Christ with “From Despair to Hope” and interviews Skip Garmo. Musical performances from the Southern California Children’s Advanced Chorus and the Hour of Power Choir. Pastor Bobby continues the message series based on the Mind of Christ with “From Entitlement to Gratitude” and interviews activist and author Star Parker. Musical performances from the Albert McNeil Jubilee Singers, Dorothy Benham, Daniel Rodriguez and the Hour of Power Orchestra. Pastor Bobby concludes his message series for the season of Advent with: “Love: Care for Human Good.” Musical performance from Daniel Rodriguez, Nita Whitaker and the Hour of Power Choir and Orchestra. Pastor Bobby continues his message series for the season of Advent with “A Pervasive Sense of Well-Being” and interviews Doug Mazza. Musical performances from Freddie Ravel, Tom Leonard and the Hour of Power Choir and Orchestra. Pastor Bobby continues his message series for the season of Advent with “Keep Watch; Take Heart” and interviews businesswoman and author Barbara Johnson Witcher. Musical performances from the Hour of Power Orchestra and the Albert McNeil Jubilee Singers. Pastor Bobby prepares our hearts for the season of Advent with his message “The Hope of Nations.” Musical performances from J. Mark McVey and the Hour of Power Orchestra, along with Richard Rivale and the Hour of Power Choir. Pastor Bobby continues the message series based on the Mind of Christ with “From Bitterness to Blessing” and interviews author and speaker Dr. Sarah Sumner. Musical performances by Nita Whitaker and Dana Baker, along with the Hour of Power Orchestra and Choir. Pastor Bobby begins a new message series based on the Mind of Christ with “Sanctifying the Imagination” and interviews Dennis Prager. Musical performances from Joslyn Sarshad and the Hour of Power Choir.